The thoracic cavity of human body is supported by a skeleton that is made up of 12 pairs (n=24) of ribs. Out of these 24 ribs only 10 pairs (n=20) of ribs are attached to the breast bone i.e. sternum. The other 2 pairs (11, 12) are free floating ribs and do not attach to the sternum. The ribs are attached to the sternum by the help of a cartilage and the joint is known as “costochondral joint”, where costo stands for ribs and chondro for cartilage. If a rib separates from its cartilage, the costochondral separation occurs. How can a rib separate from its cartilage? A direct blow can cause the rib to break away from its cartilage, usually accompanying a rib fracture. Other reasons may be: violent and improper sharp twisting movements and violent coughing (since cough develops high pressure in the thoracic cavity and moves ribs). Hyper mobility may also be a cause. A rib may also be separated if the ligaments holding them are weak or loose. What symptoms accompany a costochondral separation? Sudden pain which may subside initially; this may worsen later. Pain increases with deep breaths, coughing and sneezing etc. A bruise may or may not be present related with blood vessel injury. Your doctor may ask you to get a chest X-ray done to rule out the condition and look for any injuries e.g. lung damage or bleeding etc. which may be present. What is the treatment for the condition? Rest: the best way to relieve pain and let the injury heal. 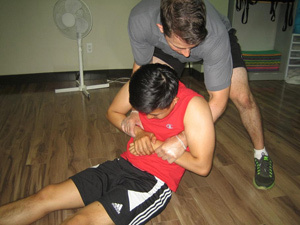 Icing: using an ice pack or simply ice wrapped in a thick cloth or towel should be patted against site of injury every 20-30 minutes for 2 to 3 days for the pain to subside. The swelling or bruises will also disappear. High volt electro stimulation: is good in relieving pain and also increases healing process. Ultra sound: this will increase circulation to the area and again increase healing and decrease pain. If the injury is healing or has almost healed, use a heat pad at the area; this will increase blood flow and deliver nutrients to the area with removing any mediators of inflammation. If the separation accompanies rib fracture, the fracture will take 4-6 weeks to heal. If only the separation is present, daily life activities without pressure exertion on the injured area may be carried out. These activities can be continued if the pain doesn’t return. To alleviate pain, drugs like: ibuprofen (NSAIDs) etc. may be taken. One important thing to remember is that one should not continue to be in the same position for long periods of time; for instance, if sitting for a long period of time, interrupt your posture by standing up or moving or stretching a little, this slight movement will help any further derangements that may be followed.